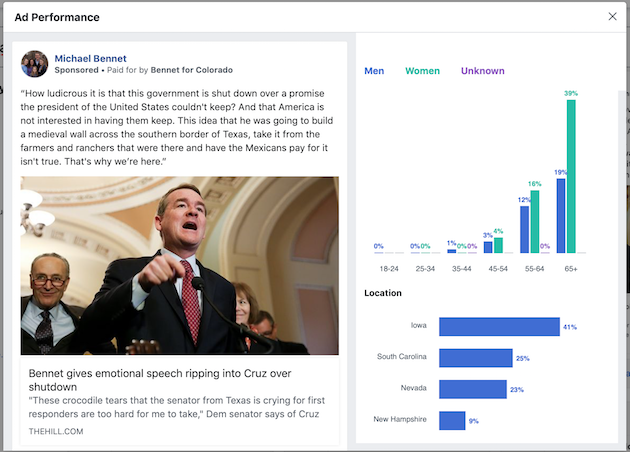 Colorado Democratic Senator Michael Bennet has taken his rhetorical explosion on the Senate floor last week and is now using that moment as the basis for Facebook ads running in key early primary and caucus states of Iowa, New Hampshire, Nevada, and South Carolina. Bennet is just one of many Democratic senators thinking of running for president, but has a much lower profile compared to other potential contenders like Cory Booker of New Jersey, or Kamala Harris of California, who has already announced her candidacy. However, last week during debate on the Senate floor, Bennet rocketed into the spotlight after giving a heated response to complaints by Sen. Ted Cruz (R., Texas) about paying the Coast Guard while the government was still shut down. "I seldom as you know rise on this floor to contradict somebody on the other side," Bennet began. "I've worked very hard over the years to work in a bipartisan way … but these crocodile tears that the senator from Texas is crying for first responders are too hard for me to take. They're too hard for me to take." Bennet's tone and volume increased as he pivoted to talk about the 2013 shutdown, which coincided with record flooding in Colorado. "When the senator from Texas shut this government down in 2013, my state was flooded. It was under water. People were killed. People's houses were destroyed. Their small businesses were ruined forever. 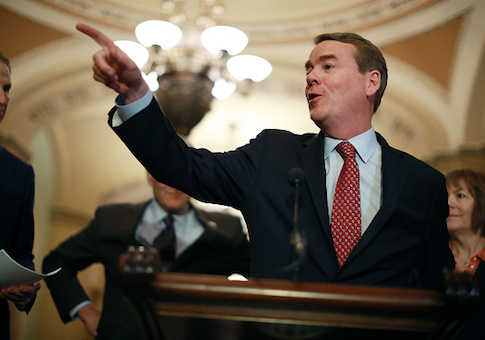 And because of the senator from Texas, this government was shut down for politics," Bennet said. The moment went viral on social media. For example, a quick retweet of the Bennet video by ABC late night host Jimmy Kimmel got nearly 54,000 likes. C-Span's video of the debate, posted on YouTube, was watched more than 435,000 times. Bennet's campaign did not respond to a request for comment on the social media campaign to the Colorado Independent, which first reported the connection to the important early voting states. Bennet's low-key approach to the Senate and his subsequent outburst couldn't help but stoke people to draw connections to a possible presidential run. "Running For President Senator Bennet is a lot more fiery than the typical Coolest Cucumber In Congress Senator Bennet," local news anchor Kyle Clark tweeted. This entry was posted in Issues and tagged Michael Bennet. Bookmark the permalink.